Last night, Dorianne and I had dinner at Mary Stec and Richard Clark’s (again). Mary was trying out a recipe for her upcoming Autumn in Tuscany cooking class (sold out), and was also preparing a coq au vin for the main course. Dorianne and I dug into the French area of our cellar and came out with a Burgundy and Bordeaux. Both wines were exceptional. The appetizer was squash ravioli with balsamic and sage; Mary used won ton instead of pasta. It was a little sweeter than expected, but very good. We began with the Bordeaux, a 2007 Chateau Millens Saint-Emilion Grand Cru that we purchased in Saint-Emilion in 2013. The wine shop where we purchased it, as part of a mixed case, purchases the entire production of this small producer (so you will not be able to find this amazing wine, except at that shop – sorry). The Bordeaux blend, Cabernet and Cabernet Franc, was very well structured, with a nice mix of cherry fruit and minerality on the nose, and hints of cherry, tobacco, and chocolate on the tongue. It finished very well. This wine was not a perfect match for the unexpectedly sweet appetizer, but it was a very good wine. We still have a couple of bottles left, and the wine could use some additional time to age. 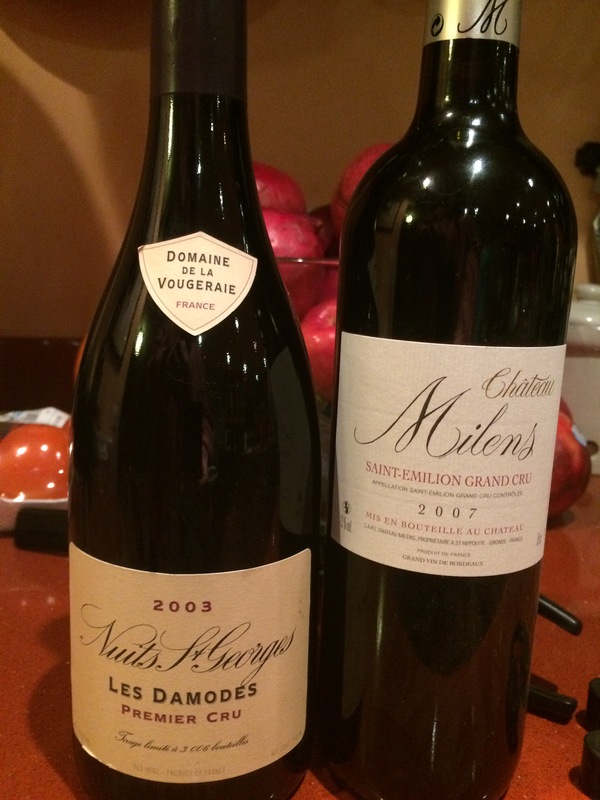 With the coq au vin, we poured the Burgundy, a 2003 Domaine de la Vougeraie, Nuits St. Georges Les Damodes Premier Cru Pinot Noir. This wine was a Christmas gift from Dorianne a few years ago. It was simply magnificent. 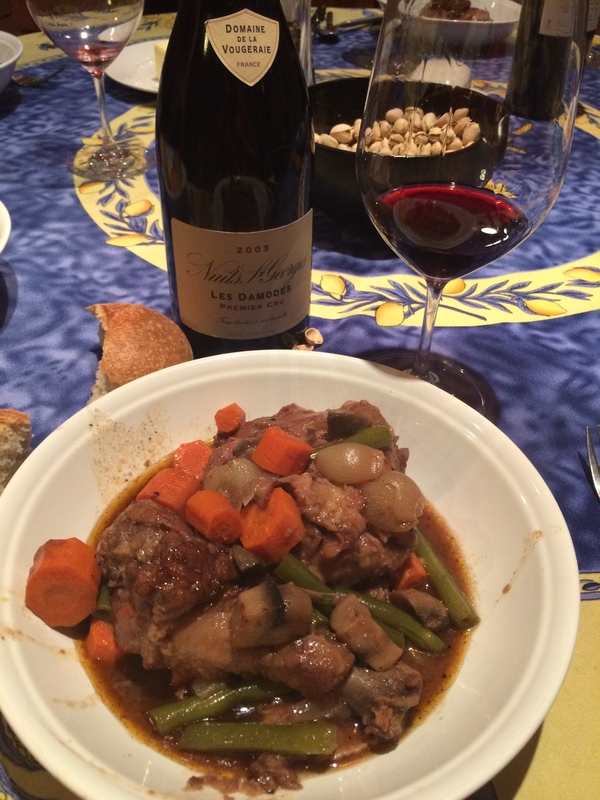 Coq au Vin by Mary Stec with the Domaine de al Vougeraie Burgundy. The nose was very complex, with floral notes of lavender and rose predominating. The wine had a nicely structured mouth-feel, velvety smooth, a bit softer than the Bordeaux, as you might expect. The flavors were berries, floral notes, and just a hint of minerality. This wine also had a great finish – something that I usually do not notice. I was surprised to see that some of the online scores for this wine were only in the high 80’s. I would score it higher. These were special wines pulled out for a special dinner, and not every day wines. That being said, they both delivered a superior experience that you would not find in an everyday wine. For more info on my philosophy of wine, go to the ABOUT section.